Our mission is to provide a positive safe environment conducive to the proper development of all competitive gymnasts. Proper development means that each girl is working at her personal best and developing into a trustworthy, respectful, disciplined gymnast who is confident in her talents and abilities. Our goal at Boost Gymnastics is to develop each individual’s gymnastic potential in a safe and enjoyable atmosphere. Using specific gymnastics progressions and a highly trained gymnastics staff, each gymnast will learn the correct fundamentals and basic skills which will equip the athlete with the knowledge to be the best that their potential and desire will allow them to be. Team selection is based on skill progression, core testing results, attendance, behavior, motivation, parental support, and mental toughness. We respect all of our athletes and do not show favoritism to any of them. We do, however, treat them as individuals. This is a team, but gymnastics is an individual sport. They will be coached on a case-by-case basis, as all people are different and require individualized techniques to help them reach their individual goals. Since each individual is different, not all will advance at the same rate. It is not uncommon for a gymnast to compete at one level for multiple seasons until they are ready to move to the next level. Pre-Team is part of our Competitive Team Program. An invitation is required. It is for girls ages 4 years old and up who show the potential to benefit from more intensive training. The expectations for skill development are higher in this group. Pre-Team consists of USA Gymnastics Levels 1 & 2 skills, and girls are expected to consistently perform these skills at a high level before being invited to our Competitive Team. 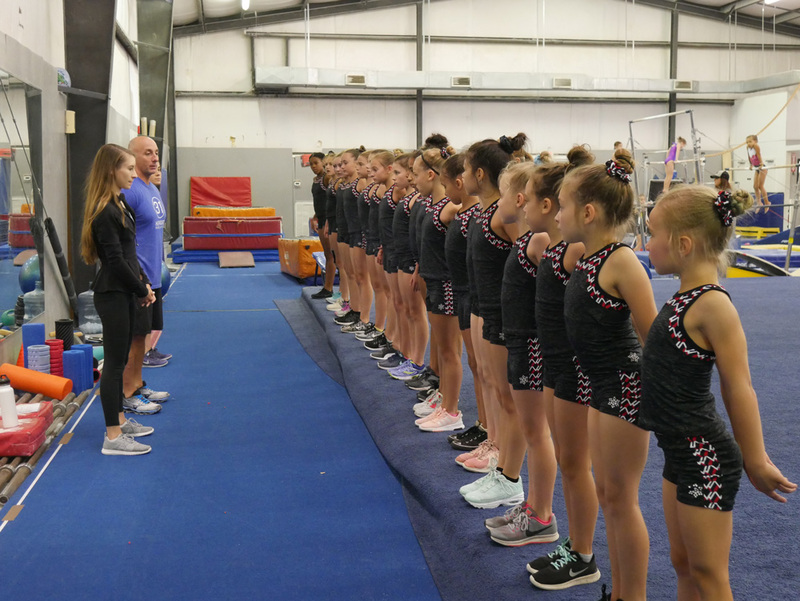 Pre-Team gives both gymnasts and parents an understanding of the commitment and dedication required to be a part of our competitive gymnastics team. The girls on Competitive Team learn more than just higher level gymnastics skills. Our Team Director and Head Coach Michael Durante believes that “gymnastics is a sport that develops your child’s mind and body like no other sport can, while preparing them for success in school, life, social situations and virtually all other sports. Gymnastics can serve as a launch pad for a lifetime of health and fitness. In the gym your child can have fun, make friends, discover the value of setting goals and the importance of respect; learn how to follow directions; time management; and how to be a leader. She can do ALL of this while building strength, flexibility, balance, speed, agility, power, coordination, and grace.” Our girls compete compulsory USAG Levels 3-5 and Optional Levels 6-10.